In elementary school we all spent time cutting paper hearts for crushes, but now that we've gotten older, the classic heart has gotten more sophisticated. Our experts have put together an arrangement using the same iconic shape with more adult tastes in mind. 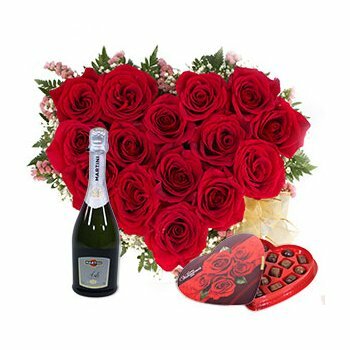 Your recipient will receive a bottle of Martini Asti, romantic Chocolates, and 16 red Roses arranged in a breathtaking Heart Display. Go over the top this Valentine's Day, Say I Love You, or sweep her off her feet with Two of Hearts.